This new exhibition will open at Sundaram Tagore Galleries in Hong Kong on Oct 18. 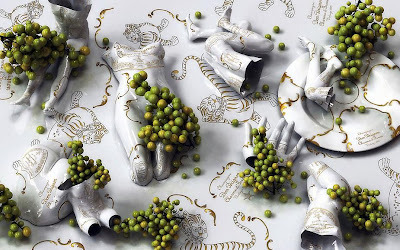 For his two new series, Fragile and Drunken, Korean artist Kim Joon composes appealing landscapes of porcelain-like human bodies tattooed from head to toe in the brand imagery. Using digital prints exploring he explores universal human themes of fragility, seduction and imperfection. Drunken-Mouton Rothschild, in which random body parts tattooed with the logo of the famous French winemaker are spread out between gilded porcelain plates and lush fruit, illustrates themes at the heart of all of Kim’s works: an exploration of the human desire for things to admire, covet and love. Those can be things that are good for us, as well as things that are dangerous—sometimes it is just a matter of dose or perception. This is the paradox that he addresses at length in Drunken, his most recent series. 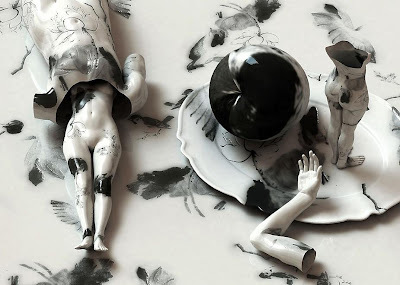 With the Fragile series, which Kim created just prior to Drunken, he also used porcelain-like human figures, but these are hollow, lacking limbs, and distorted. Imperfection is a recurring theme in Kim’s work, which started with his fascination for tattoos and his discovery that tattooed men were deemed unfit for military service in Korea. The artist’s exploration of tattoos stems from his experiences tattooing his peers while in the Korean military. According to Kim, tattoos are not only physical inscriptions on the body but also signifiers of mental impressions left on the consciousness. Alluding to society’s weakness for material objects, Kim’s tattoo imagery reflects our obsessions and deep-seated attachments. The artist creates these images using three-dimensional computer graphics.